Length: 4 - 5mm. Background colour: brown or black. 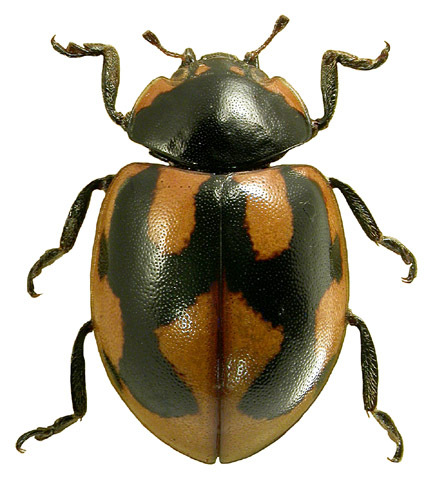 Pattern colour: black stripes, spots and patches, sometimes resembling an Egyptian hieroglyph. Number of spots: 0-7 (5). Spot fusions: common. Melanic (black) forms: common. Pronotum: black with anterior-lateral white marks. Leg colour: black. Fourth-instar larva: dark grey/black; with black tubercles producing fine hairs; pale yellow patches in the centre of second and third thoracic segments; middle and outer tubercles on abdominal segments one and four are pale yellow/whitish. Pupa: unknown. Habitats: Hieroglyphic ladybirds are found on heathland, often on old heather plants, or where the heathland has been invaded by scrub. This species is also found on acid grassland and heathland mosaics. Host plants: Hieroglyphic ladybirds are strongly associated with heathers. Food: heather aphid, Aphis callunae; eggs/larvae of the heather leaf beetle, Lochmaea suturalis;chrysomelids within the genera Altica and Galerucella. Overwintering sites: Hieroglyphic ladybirds overwinter in litter under heather, pine trees and gorse bushes.